Happy Hump day everyone! 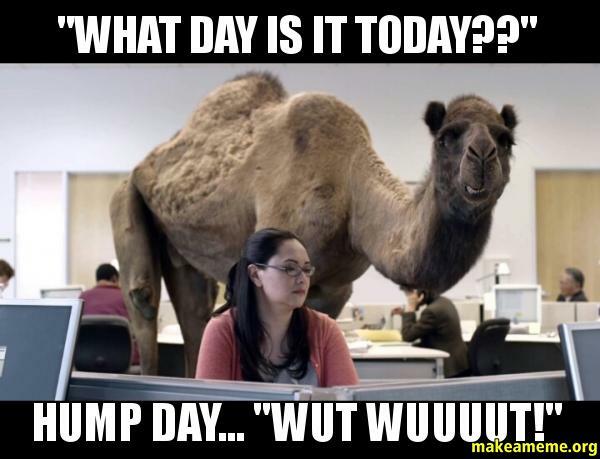 Did you and all your coworkers watch the Geico camel commercial this morning in celebration of it being Wednesday?! I woke up at 5 AM today hoping to hear the rain had stopped. The radar was clear! Woohooo! I was so thankful for a clearing in the radar so I could get my usual Wednesday morning run in. On the training plan for today was 5+ miles. Meaning I needed to reach 5 miles but keep on going depending on how I feel and if time allows. I made it out the door around 5:15, and it felt like I had just hit a brick wall. It was HUMID and much hotter than my morning runs have been lately. 64 degrees is not my style anymore! Luckily I dressed very lightly to help keep me cool, but I was sweating like a pig regardless due to the high humidity. The whole run was a struggle. I wouldn’t call it my most difficult run, but it was not fun to keep pushing myself today. I think this was a mix of the temperature and my tired body from teaching two Jazzercise classes last night. This is the slowest pace I’ve had in a while, so I’m chalking this up to the weather I guess. Oh well, today wasn’t meant to be a crazy tempo run, so I’ll take a slower 10K before my workday starts over no run at all! 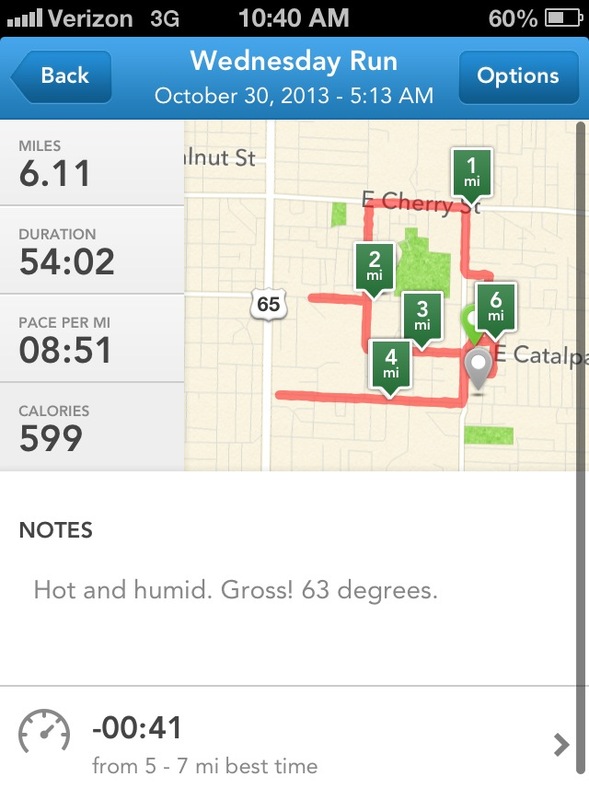 I’m still feeling a little off after my run this morning. I think my body was more fatigued than I realized before I headed out today. My 5:40 pm class last night was extra intense. I videotaped myself to send into corporate for evaluation! I have until November 15th to get a good class recorded and sent in, so I wasn’t too nervous when I set up the camera last night. I have lots of other classes that can be recorded between now and then! But once class started, I went into super instructor mode and worked really hard since the camera was on me. About once or twice a year we get evaluated by Jazzercise, Inc. Sometimes they send out Quality Coordinators to visit our classes and do the evaluation on the spot. And other times they will just request a video. Lucky me only has to send in a video this time! I think the video from last night’s class should be more than sufficient to send in. The students and I were tired and disgustingly sweaty after the class, so that has to count for something! Soooo, you all know my birthday is this Friday! I’ve so excited! And Nick has been stewing over what to get me for a gift. I keep telling him I’m not sure because I really don’t need or want much right now! But we finally came to the conclusion that I need some good, thermal running tights for my half-marathon in January. I found a pair on Lululemon that I fell in love with, and Nick obliged to get them for me for my birthday! I picked out these Speed Tights, and I cannot wait to get them and try them out! The solid black color was sold out in my size, so I opted for the black with a pink waistband. I love their running pants because of all the pockets! There’s even a nice big pocket on the side of the leg that will be perfect for storing my phone or my gloves if I start getting too warm. They should be here by Saturday or early next week, so let’s hope the temps are cool enough for me to try these babies out! The rest of my day will be busy with work and cleaning my house! With my family coming into town for my birthday on Friday and Saturday, I have some major cleaning to do. Mostly vacuuming and putting things away, so I’m hoping I’m feeling extra productive when I get home at 5 this evening. I also need to pull out an old Halloween costume for Jazzercise tomorrow…. Should make for a fun evening! Enjoy the rest of your day, and I’ll see you later! Class last night was awesome and it will be excellent to send for evaluation, in my opinion. Great job! Ah, thanks Dede! Get excited for tomorrow. I’m going goodie hunting after work for everyone that shows up to my class at 5:40!